The Camino de Santiago is a pilgrimage route, the Way of St. James, to Santiago de Compostela in northwestern Spain which has been active for over 1000 years. The focus in Santiago is the cathedral which is the reputed burial place of Saint James the Greater, one of the apostles of Christ. While many of the routes generate in France they in fact can generate anywhere in Europe, and the presence of pilgrims on the trail having walked directly from their homes in Belgium and Switzerland, for example, is not uncommon. One route, the Arles route, actually connects Santiago, the third most poplar Christian pilgrim destination after Jerusalem and Rome, with Rome. While there are several routes available to Santiago, the most popular is the roughly 800km Camino Frances which is generally characterized as originating in Saint Jean Pied du Porte in the French foothills of the Pyrenees. 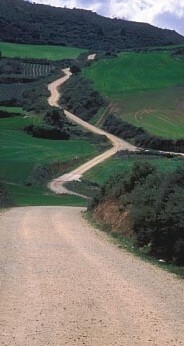 The accompanying articles describe two Camino initiatives pursued by the author. "The Missives" are a series of slightly edited light-hearted e-mails l sent from the trek to the home front to keep abreast of the highlights of the journey all those who wondered why the hell anyone would walk 800 kilometres in one shot. It is considerably shorter than the journal and lighter in style but lacks photos. The illustrated "The Journal" is designed as reading for those seriously contemplating the journey and gives more detail as to what one might expect to encounter in its undertaking. Arles 2010 is an illustrated summary of a 350km walk in 2010 along the Arles route in southern France between Montpellier and Toulouse. That initiative had a much different feel that the Camino Frances in respect of topography, culture, history, and fellow pilgrims.